We had a fantastic week last week, if a bit hectic, working at 2 lovely schools with the most wonderful bunch of children. 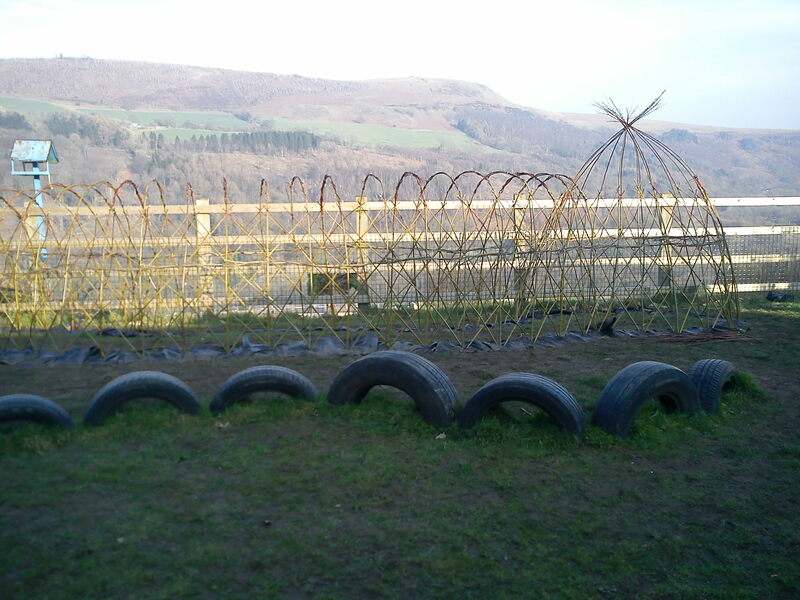 Both schools were surrounded by the most beautiful views in two very different valleys …..
At Crickhowell we worked in 3 different areas to provide shade and shelter and play structures for both Junior and Infant children. 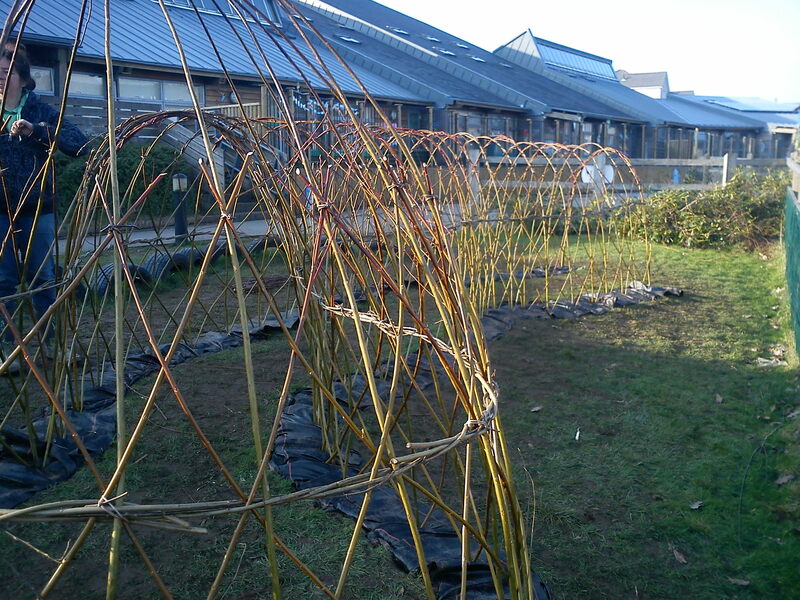 The juniors wanted a dome with a wiggly tunnel exactly opposite their exit from the school, the infants fancied 3 wigwams to fit in their physical play area for ‘dens’ and we also built 2 arbours. On Day 1 we enjoyed soaking up the sunshine and enjoying the awesome views of the mountains surrounding the school, on Day 2 the torrential rain meant we couldn’t even see the mountains! We were joined by very keen parents who didn’t mind a total drenching to help us finish the project. I was the lucky one who worked with the infant children making willow crowns and magic wands while Mel got soaked to the skin! After finishing at 3.30 we then went on to construct a beautiful arbour in a private garden in Abergavenny. The arbour was built to frame a 9ft ship’s bench and to our delight also echoed the shape of the mountain behind. No photos as we finished in the dark! Thursday and Friday were spent at Perthcelyn Primary School, another stunning location looking out over the valley formed by the Taff to the mountains to the East. Another playground location to stand and stare (on Day 1 anyway, no sign of any mountains again on Day 2 in the thick drizzle), although there was a little too much work ahead to do too much of that. Luckily we were incredibly ably assisted by the older children at Perthcelyn, especially Ryan and Niamh who became our willing apprentices for the 2 days. We have NEVER come across a pair of such confident, dedicated, skilled children – so much so that we handed over our hoodies and both became official staff members! The rest of the team were also superb and we made great progress with the tunnels, arbours and wigwams which were on order for this school. I am very envious that Mel has got another opportunity to go back to this lovely school for Day 3! We have a lovely group of people coming for this course from all over the country – we look forward to meeting you all! A massive thanks to Deb for taking notes, typing them up and sending them to me in an e-mail – a lot harder to lose than an envelope, although I promise I still have this month’s safe! We had a great meeting with more than 20 people attending to agree the programme for this year and weave some beautiful willow hearts from fresh Black Maul and Flanders Red willow. Yvonne brought some gorgeous organic willow for our basketmakers to pounce on. Anyway, here is the programme for this year, expect there will be changes on the way but it will be a more relaxing way to do things I think. Again thanks to everyone for offering to help. The Group agreed a list of activities for the forthcoming year and agreed dates for the monthly meeting. N.B Unless otherwise stated we are hoping that all meetings will be held at Colwinston Village hall – fab venue with easily sweepable floors and loads of car parking. One summer meeting will be held at Kathy’s house in Cardiff Bay – to be confirmed. April (actual date Tues, May 3rd) Bases – practice your round, oval or square bases for finishing baskets at home. We have agreed to keep a few notes from each meeting particularly where we have agreed actions. These will then be posted on our blog. There is a minimum charge of £2.50 at each meeting for the cost of the hall and materials. Sarah kindly undertook this at the January meeting and has agreed to carry on doing this for future meetings. Dates for this year’s festival are 28th May to 25th June. Set up is on Friday 27th May. 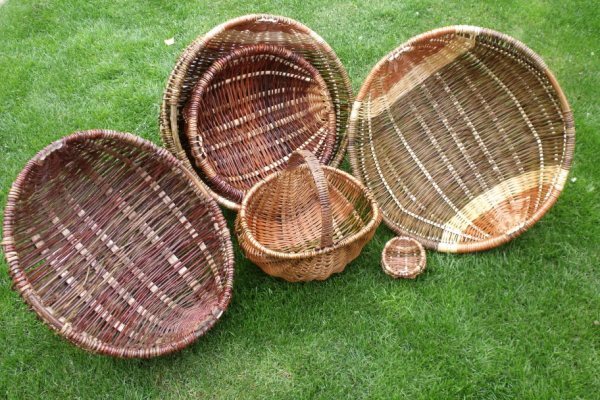 Prue Thimbleby will be running a workshop for willow and recycled materials on 3rd June. We also have a stall for exhibiting our work – this is for everyone and Maggie will be in touch with further details shortly. If anyone is interested in selling any of their work then contact Clare and Mel as we also have a table for selling willow items. Deb will be in touch to organise numbers and minibus hire. Looking forward to seeing you all again next month, if you have a sharp knife such as an Opinel knife or fixed blade penknife please bring it with you along with a piece of leather or suede to protect your knee!